What is butterfly gardening? 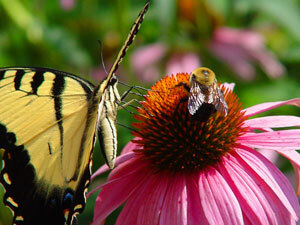 Simply put butterfly gardening is the art of growing flowers and plants that will attract butterflies to your garden. Delight your family and visitors with beautiful butterflies, but be sure to create a safe habitat for them. If you own cats rethink your plans, because it would be a shame to attract these lovely insects to their death. It is important to find out which plants and flowers will attract the types of butterflies that live in your area. This information can be found at the local library or on the internet. The design of your butterfly garden is a matter of personal preference. Typical points to consider are the size of your garden and the types of flowers and plants you want to grow. Pick a style of garden that appeals to you, but ensure it also contains the plants and flowers that appeal to the butterflies you wish to attract. Some people find it helpful to draw and colour a layout of their butterfly gardening plan to see what the finished product would look like. When planting your butterfly garden be careful how you coordinate the colours you choose for your flowerbeds. Although butterflies do not care about your choice of colour, you don't want your garden to be a hodgepodge of unrelated colours and textures. Keep in mind that warm colours like red and orange are flashy and showy. These colours have a greater impact against a strong green background. Cool colours such as blue and purple are soothing and toned down and would work better with a white contrast to create the look of freshness and brightness. Butterflies are attracted to those flowers that have nectar rather than pollen, like honeysuckle, milkweed, summer lilac, Valerian, daisies, Purple Coneflower, Yellow Sage, day lilies and lavender. To create the kind of environment that they find attractive, you will also need water of some kind. A birdbath will look attractive and keep the butterflies up off the ground, away from stray cats or mischievous puppies. A shallow dish on a post or hung in a tree will do just as well.